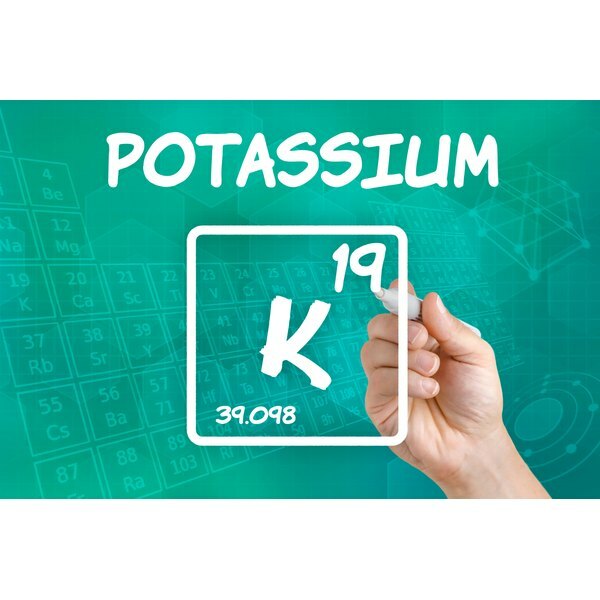 Potassium, designated by the letter K on the periodic table because its Latin name is kalium, does not thicken your blood. Vitamin K, a vitamin, not a mineral, and a completely different substance from potassium, increases your blood's ability to clot. This action does not "thicken" your blood in any way; it just increases the number of clotting factors, which help produce thrombin. Thrombin helps blood clots form. High potassium intake may also decrease rather than increase your blood's ability to clot, reducing the risk of heart disease. Your body maintains serum potassium levels within a narrow range. Potassium helps skeletal and smooth muscles contract; both lower and higher than normal levels of potassium can produce heart arrhythmia, weakness and complications that can lead to death. Potassium in the high but still normal range may also have heart-protective benefits on the blood vessels. A study conducted by researchers from the University of Mississippi Medical Center and reported in the April 1995 "American Journal of Physiology" found that increased potassium levels inhibited platelet aggregation, the ability of platelets to clump together, and arterial thrombosis, clot formation within the arteries. A University of Medicine and Dentistry of New Jersey study reported in the December 2004 issue of "Hypertension" determined that potassium chloride supplementation decreased platelet reactivity. Inhibiting platelet aggregation doesn't make the blood thinner. The blood still contains the same number of blood cells, including platelets. But when platelets stick together, they release vasoconstrictors that narrow blood vessels as well as thomboxane A2, which increases platelet aggregation and vasoconstriction. Inhibiting platelet aggregation decreases clot formation that can block blood flow through blood vessels. It's easy to confuse potassium with vitamin K, a substance that increases the blood's ability to clot. Potassium may have the opposite effect, reducing the blood's ability to clot. Do not take potassium supplements or greatly increase your potassium intake without your doctor's approval, especially if you have high potassium levels or kidney disease, which can increase your potassium levels.